As many kids are just beginning to enjoy the summer, IMPOWER is already hard at work planning for the next school year. More than 700 children and youth depend on IMPOWER each year to help provide the tools they need to achieve academic success. You can help too by participating in our Back to School Drive! 1. 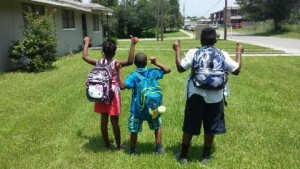 Sponsor a child/youth for $50 to supply a backpack filled with grade appropriate school supplies. Donate here. 2. Host a supply drive. Set up a collection box at your business/workplace/club/school to collect needed supplies. 3. Contribute gift cards, backpacks, or school supplies. For a list of needed supplies click here. All donations are tax deductible as allowed by law. Please contact Amber Bachura for more information at 407.215.0095 x215 or abachura@impowerfl.org. Thank you in advance for your support of this important gift drive. Together we can make a difference in the lives of children and families in Central Florida! The following IMPOWER locations are also available to drop off supplies or donations between 9am – 5pm Monday through Friday, or call 407.215.0095 x215 for special arrangements. Requested deadline for supplies is July 28th.